Title: 'Nova Francia et Regiones Adiacentes'. 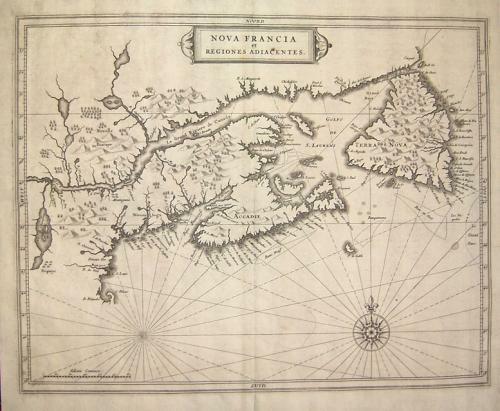 An important early map of the Maritime Provinces. Considered one of the foundation maps of Canada (Burden), this is the first printed map to show an accurate Prince Edward Island and the earliest to show a north-south orientation of Lake Champlain. The R. Saguenay is accurately depicted flowing from two unnamed lakes and Lac S. Pierre is clearly identified. As a director of the newly formed Dutch West India Company, De Laet had access to much of the cartographic work and manuscript material done at the time, including the work of Hessel Gerritsz, the official cartographer of the Company. While some attribute the cartography of this map to Gerritsz, the geography of Newfoundland is considerably different from other maps by him. The numerous Portuguese place names infer a Portuguese source for the map. In any case, De Laet's depiction of Newfoundland was copied by several other cartographers to the end of the century.